This week UM News features UM students creating a group to build relationships and do activities with local Missoulians of all ages with disabilities. 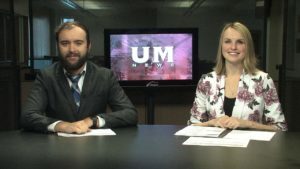 The show also highlights the end of Griz football season with the ROTC program unveiling a new cannon to celebrate touchdowns, a closer look at Monte’s involvement with the community and how Missoulians are hoping to win on and off the field by Canning the Cats during this year’s Brawl of the Wild. This week’s show is anchored by Aunica Koch and Wayne Stevenson, directed by Tiffany Folkes and produced by Maria Anderson. Ray Fanning is on the faculty of the Radio-Television Department of the School of Journalism at the University of Montana.